My buddy Dave has moved back to town (or nearby anyway, as he has a horse that needs a country location), and he came over to catch up and have a game the other day. 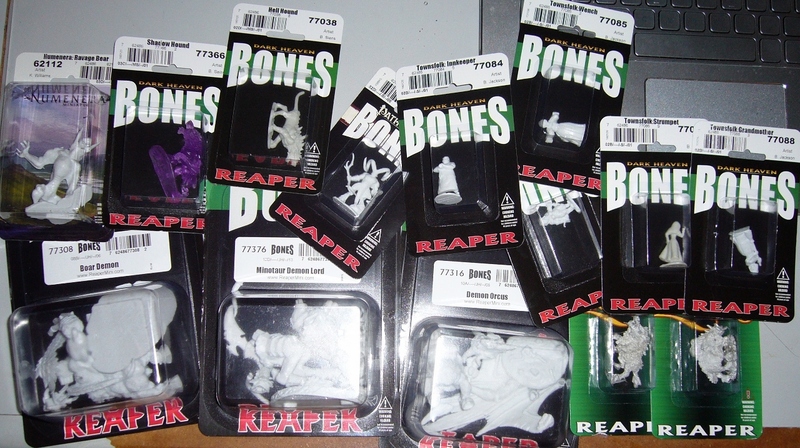 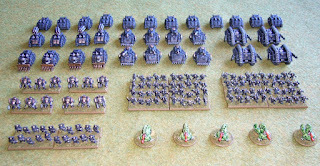 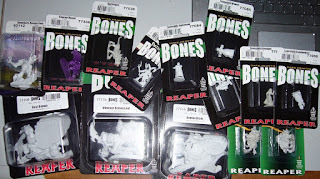 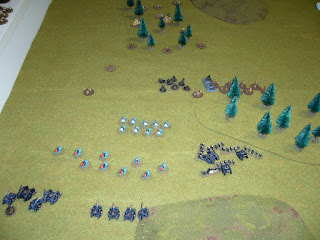 I used my Chaos with some freshly painted units, and he used his Marines, also with some freshly painted units! 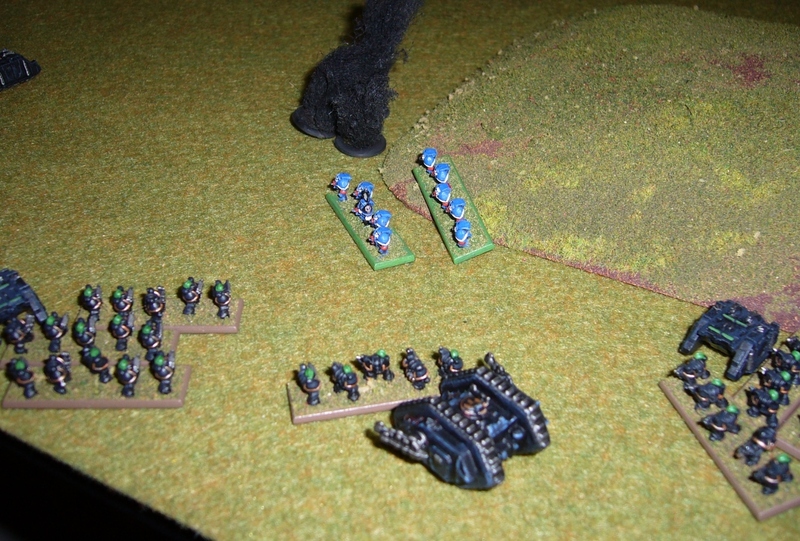 Dave went for a force with a heavy air assault component. 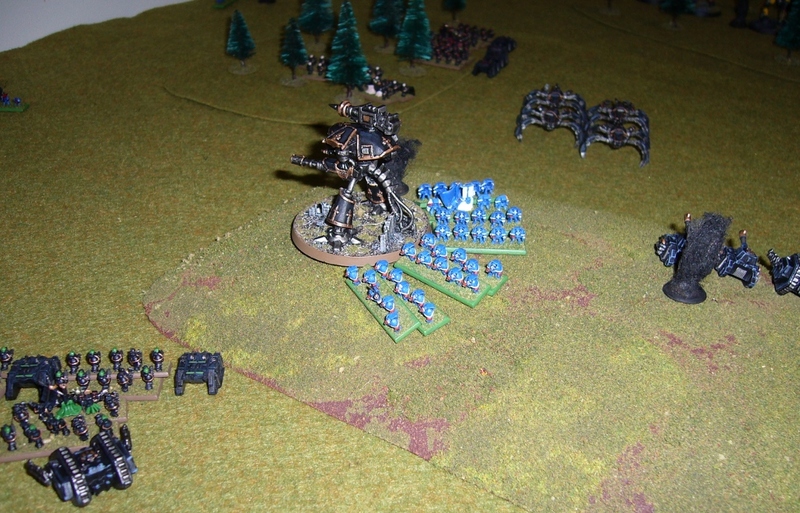 Dave set up with his Supreme Commander guarding the blitz, scouts ahead, and Warhounds behind a hill. 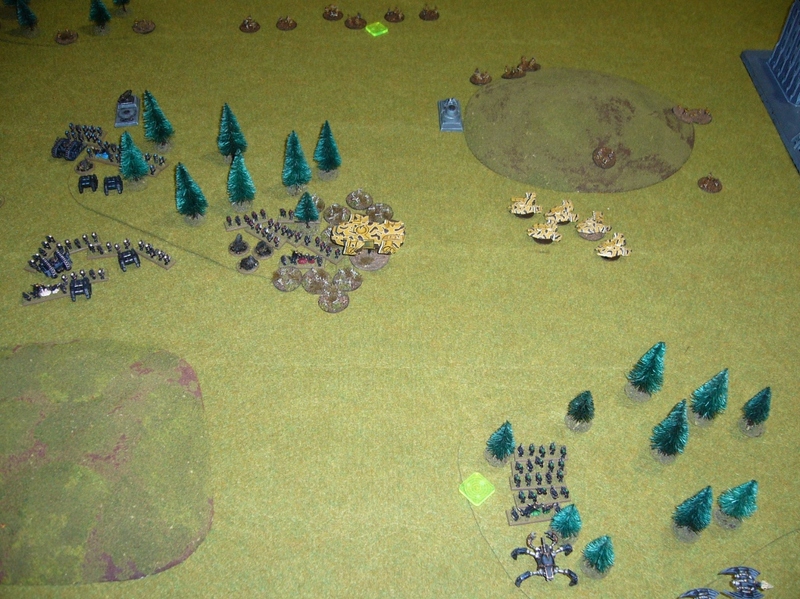 I spread out along my baseline, refusing my right flank more than the left. 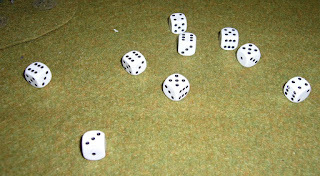 I win Strategy Roll. 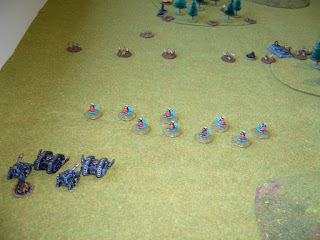 An armoured company advances and shoots the Scouts, and then they are engaged and destroyed by my Retinue. 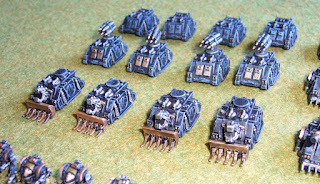 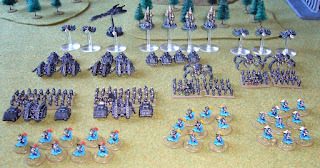 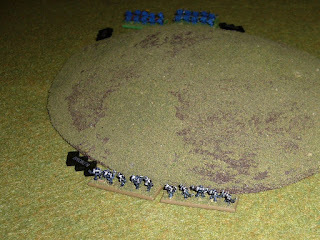 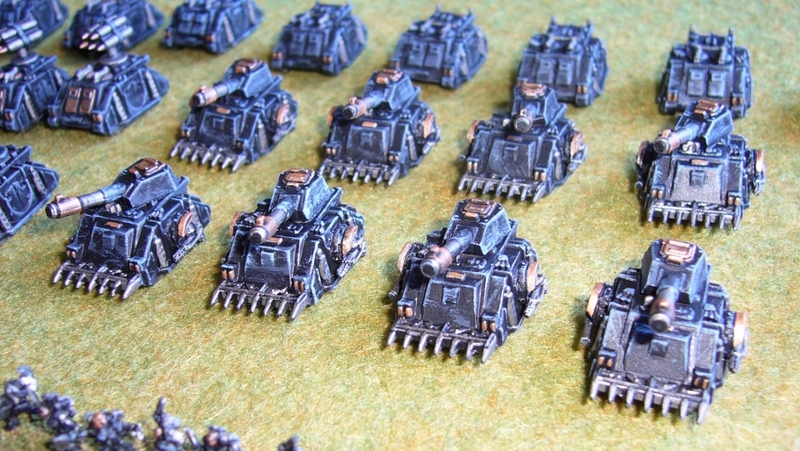 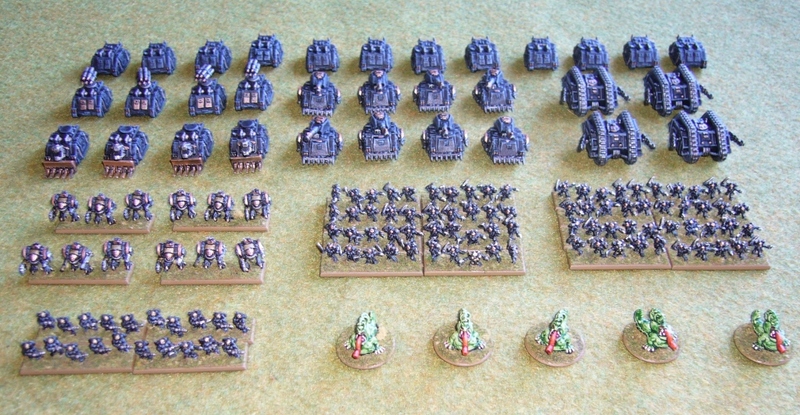 In the centre of this Retinue, one of my two Obliterators - my only anti-air cover! 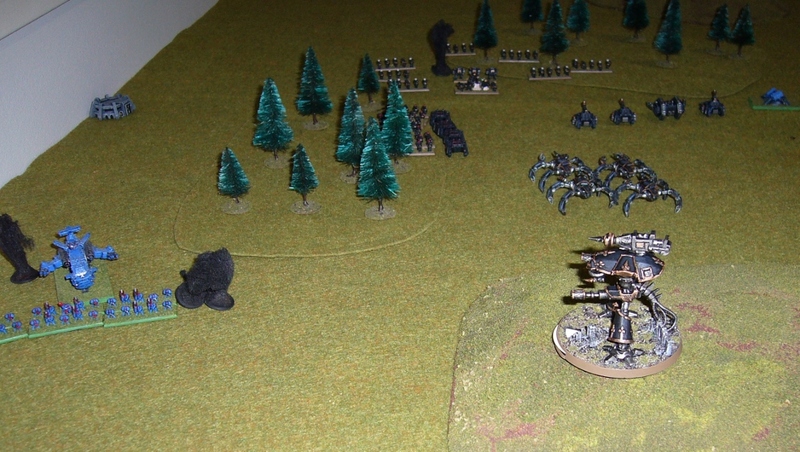 Dave, being a fan of cavalry and impetuousness perhaps, swoops in with Assault marines vs my Ravager Titan. 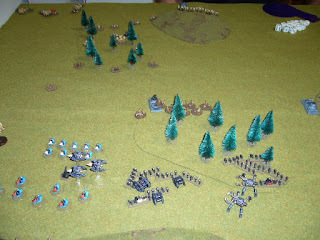 This goes poorly, and the Assault marines lose two units each, and the Thunderhawk is destroyed. 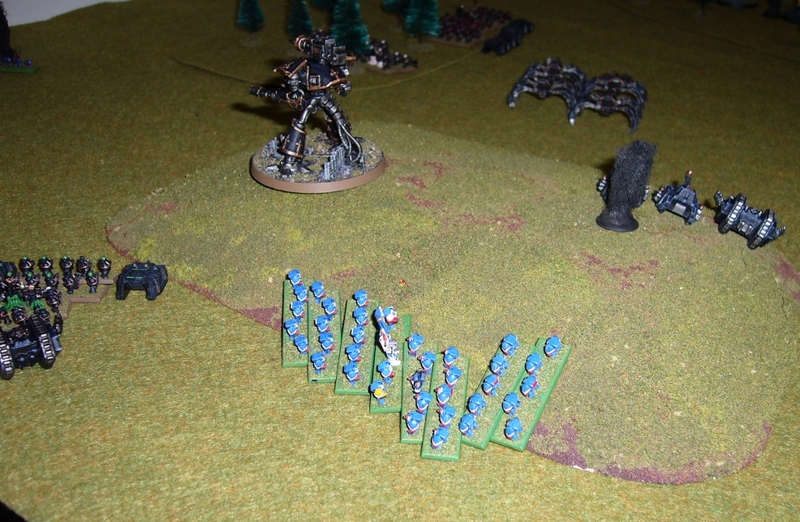 The Ravager is undamaged but loses a couple of void shields. 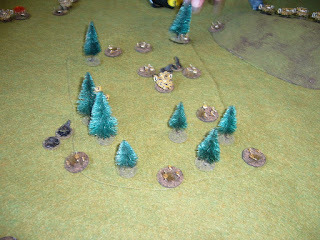 Dave retains, and Devastators arrive by Thunderhawk, engaging my Raptors. 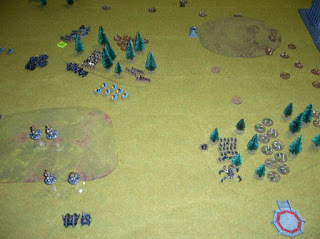 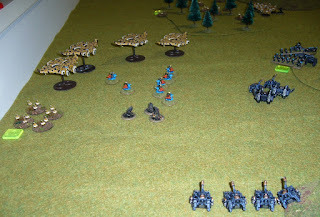 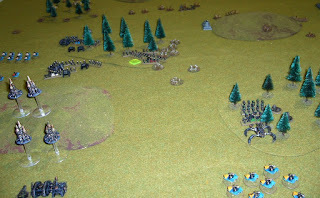 My Raptors charge towards them on the off chance the combat goes another round. 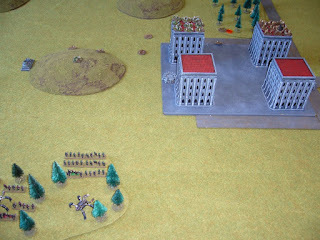 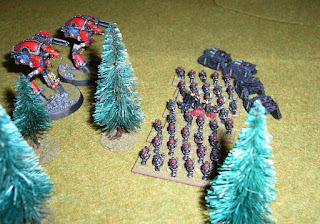 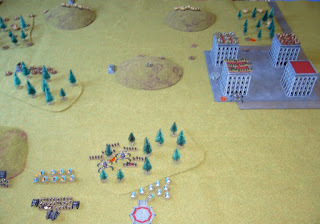 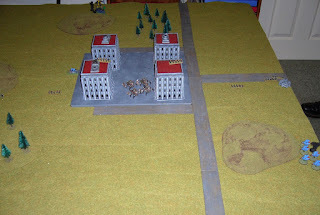 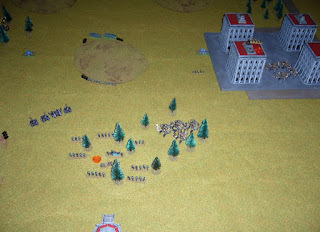 But no the Raptors lose the combat and six units for no casualties on the Devastators. My Ravager moves and kills a couple of Devastators. 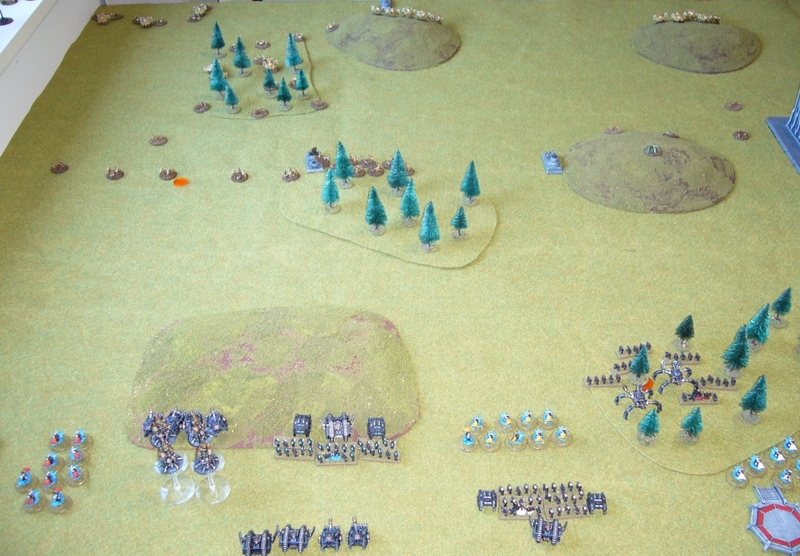 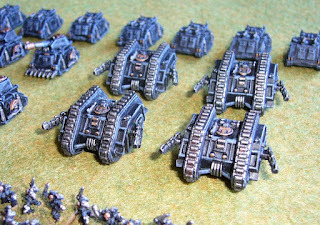 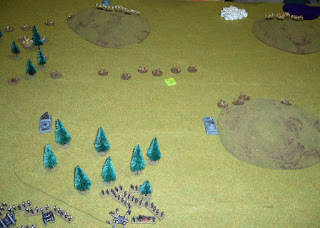 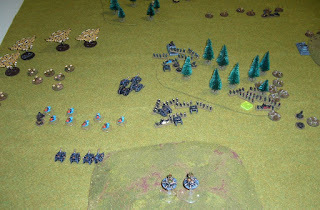 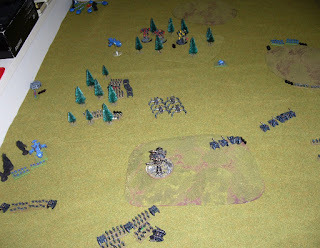 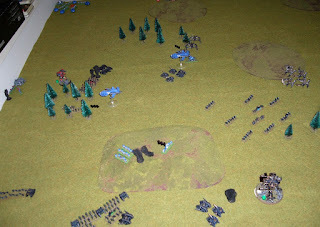 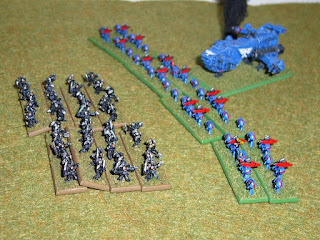 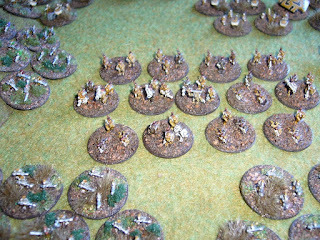 Broken Chaos Raptors, and broken Assault Marines hide either side of a hill in the centre of the table. 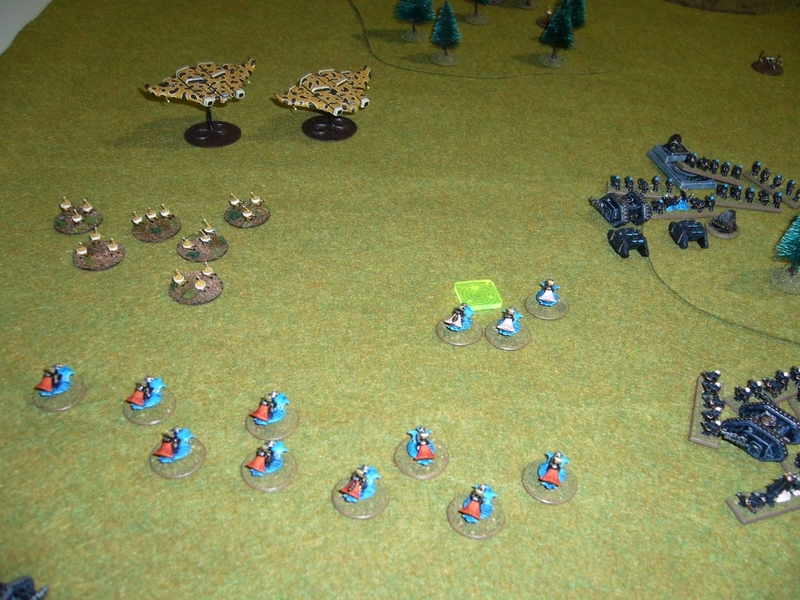 Warhounds move and unload all their firepower on my Retinue, breaking them and killing my Obliterator. Warhound "Old Yella" joins them and destroys one of my tanks. 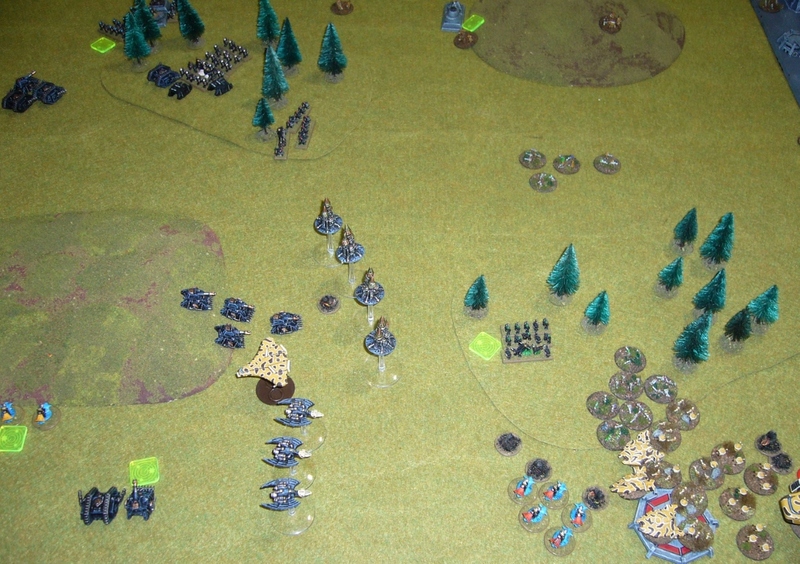 Long range shooting between various formations occurs, with Devastators losing more units, and one of my tank foramtions breaking and retiring. 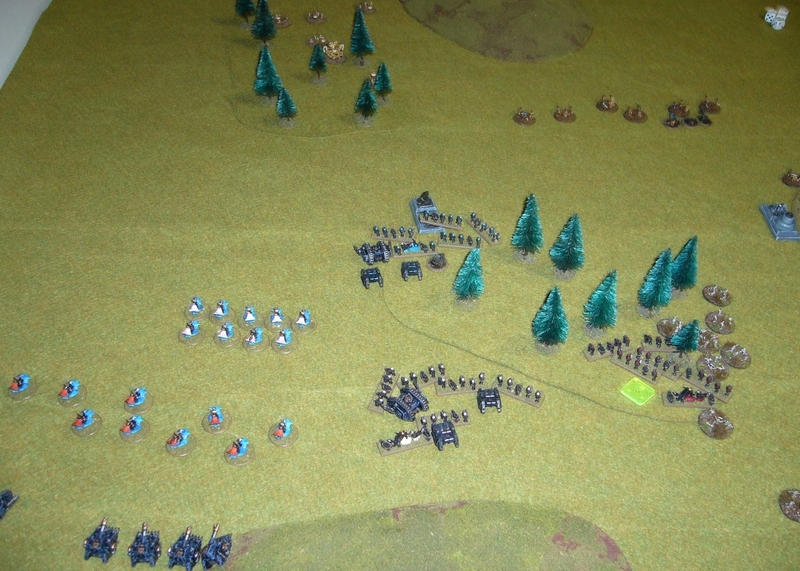 Here's the situation at the end of the turn. 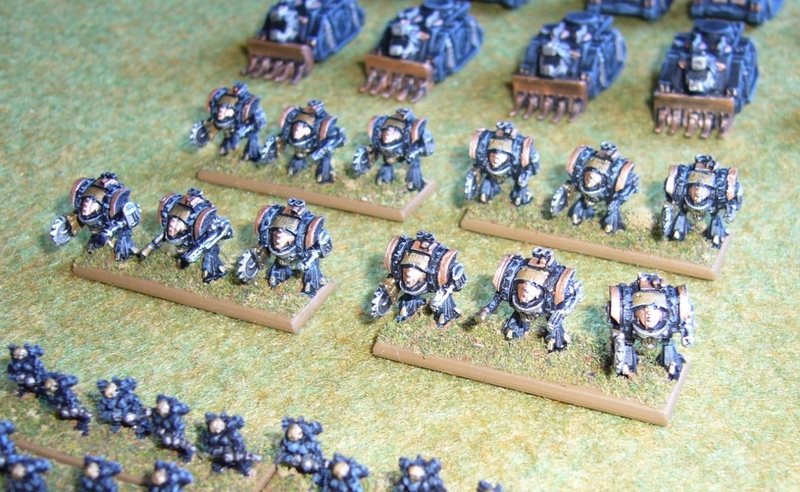 Here comes the Terminators! 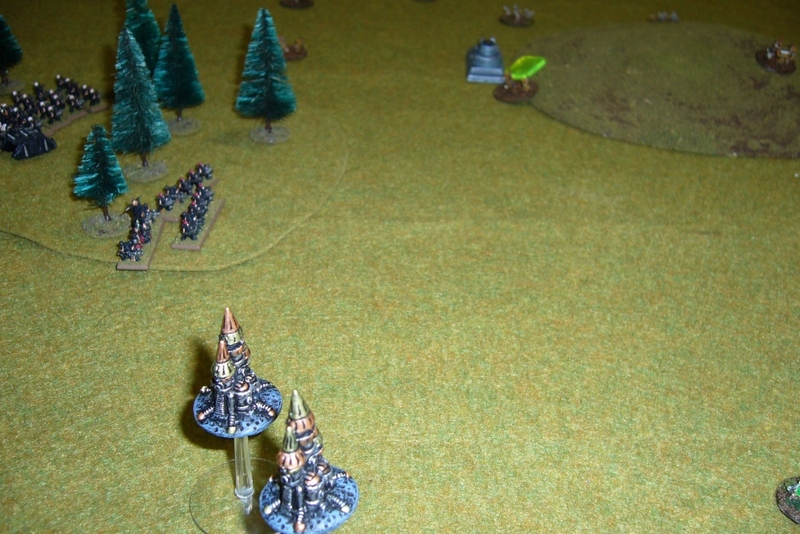 No blast markers from teleporting. And the Marines win the Strategy Roll and assault. 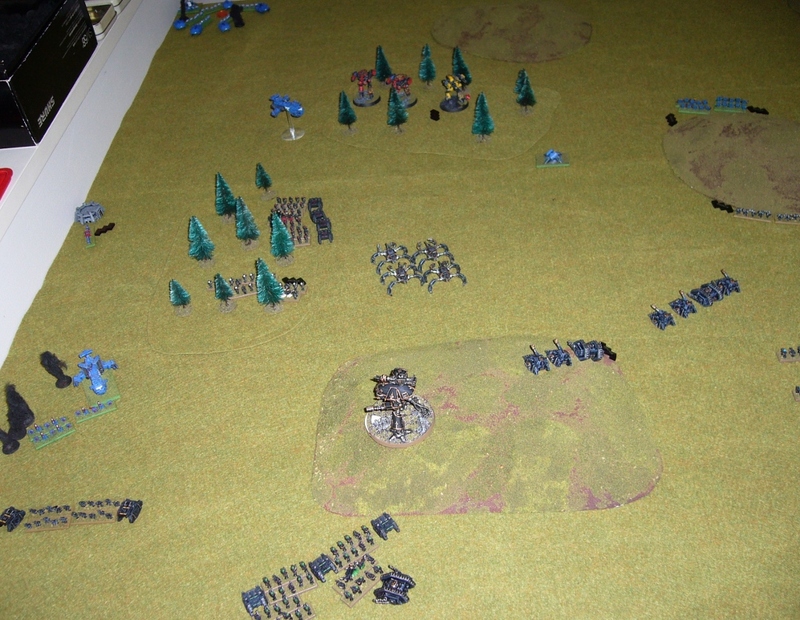 The ravager takes 3 damage from normal hits, and then has to save nine macro weapon hits(!). But I get lucky and only fail one! 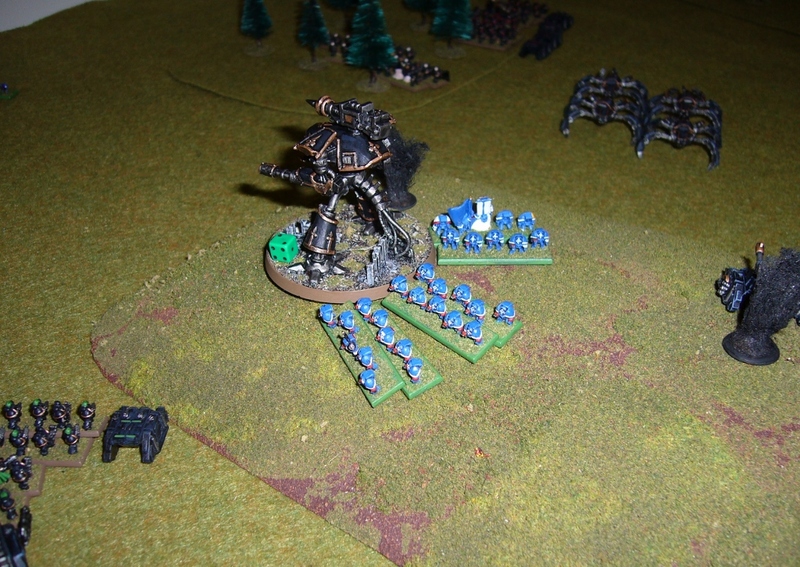 The Ravager loses and retreats with 2 damage remaining, and two terminators are killed. 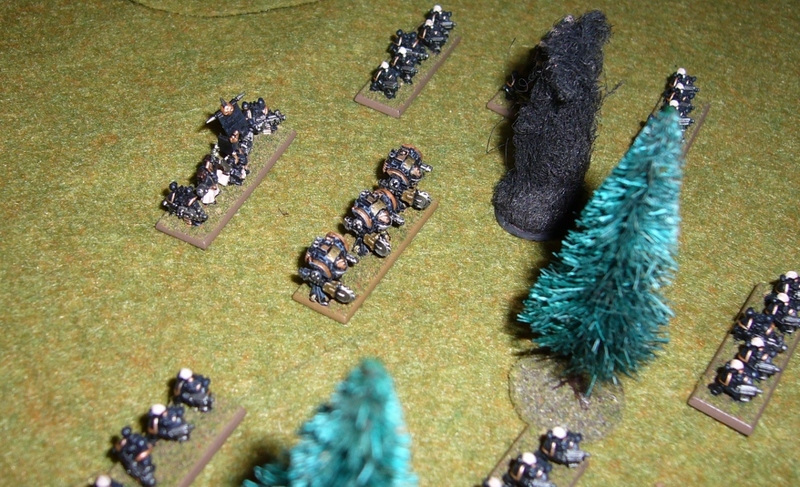 Warhounds engage my next Retinue in a firefight, but lose. 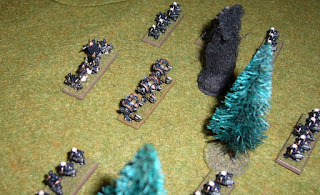 Staying where they are, and in turn assaulted by Defilers. Defilers lose one of their number but damage the Warhounds who again stay! The Retinue then engages and destroys one of the Warhounds. 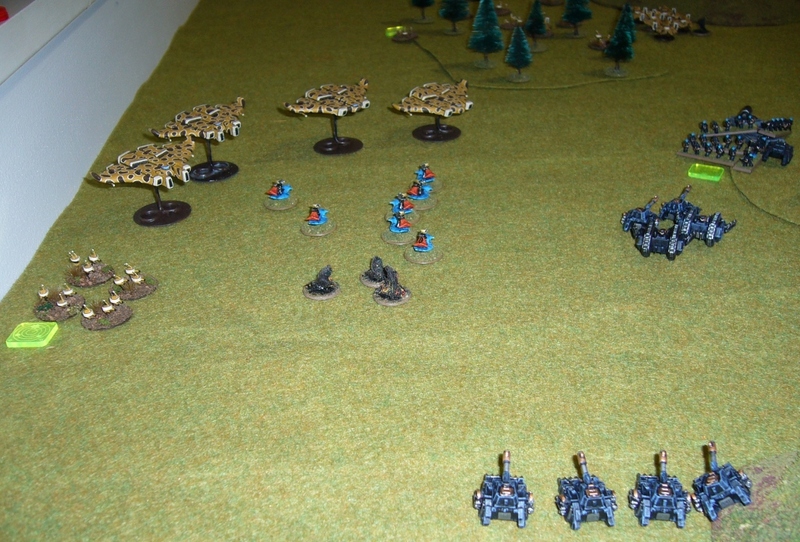 My remaining Raptors march and take the right flank objective. 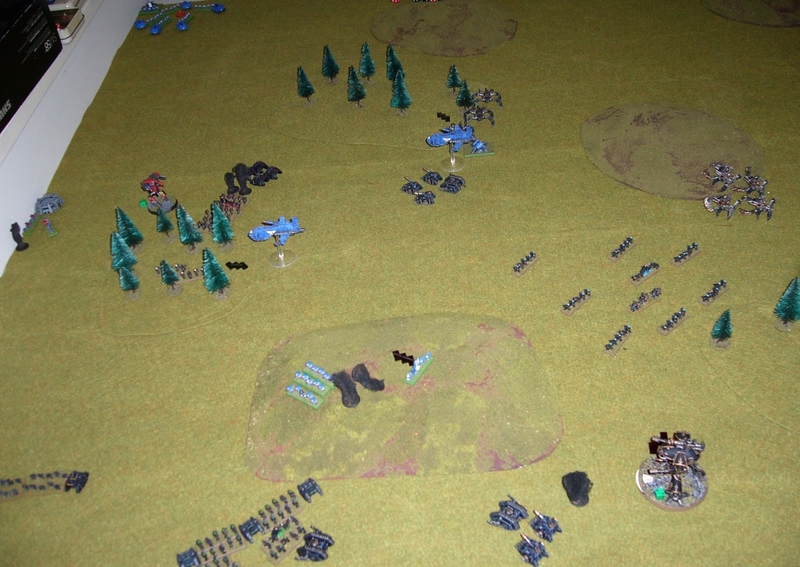 Marines win Strategy Roll again. 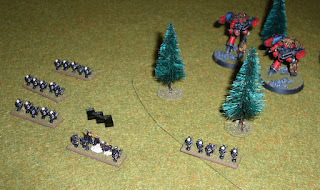 Terminators attack and break another retinue for the loss of one terminator unit. I double and shoot the Land Speeders. And then engage the Landspeeders with Raptors, but both Raptors die to multi-melta hits before the firefight support from Defilers can occur. 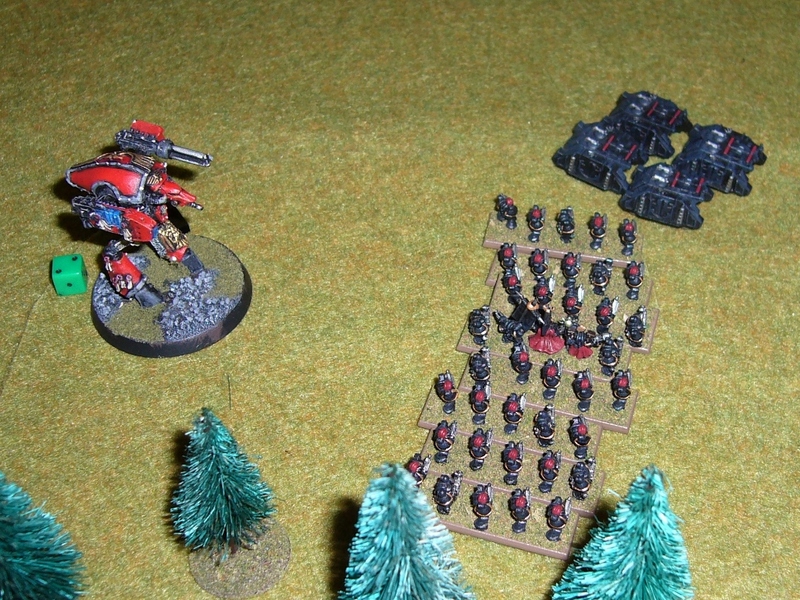 Not a great assault choice by me. Chaos continues to try and mop up on the left flank. The last red Warhound dies. Chaos take the left flank objective. 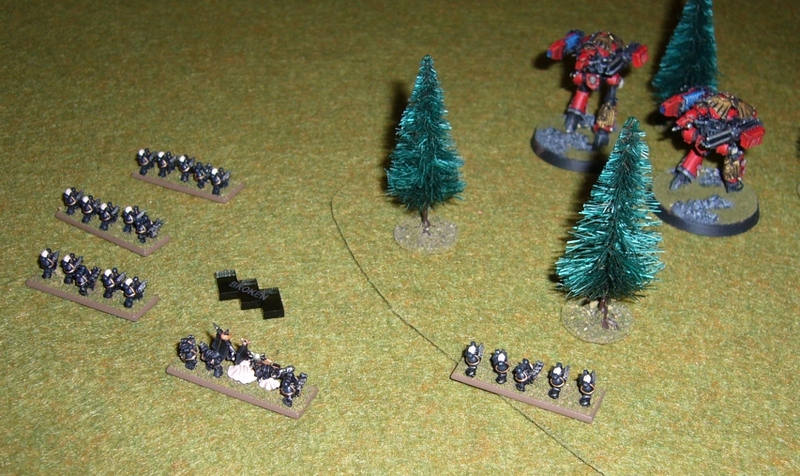 The Ravager doubles and takes a long shot with its tail gun at Assault marines guarding the right flank objective. Needing a 5+ to hit, which hits, and then the Marines fail their 4+ save. 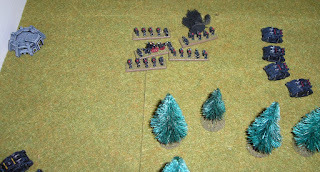 That's enough to give the Chaos 'Take and Hold' and 'They Shall Not Pass' Victory Conditions. 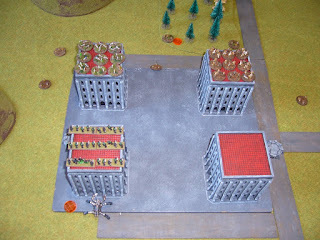 Chaos win 2-0. Interesting game and first time in ages I've played a Marine air assault list. 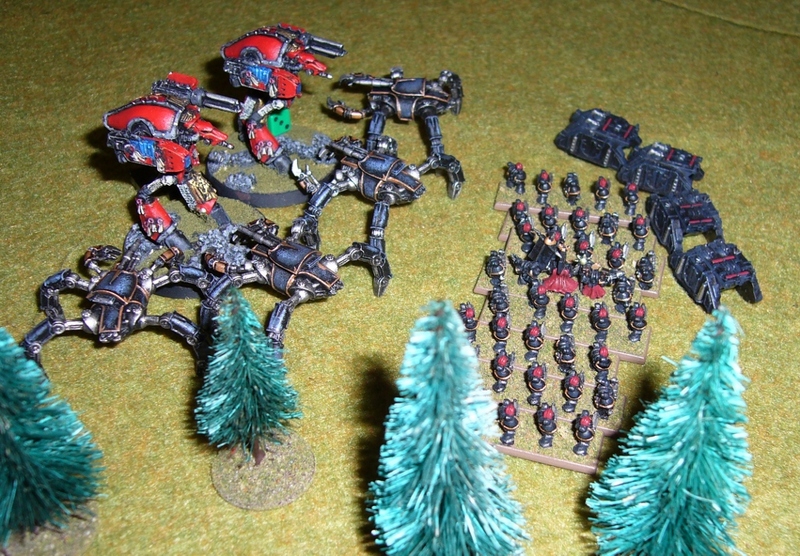 I think the first Assault Marine aerial assault against the Ravager was a bit optimistic, especially with the supports it had. I think he would probably have also been better dancing away a bit more with the red Warhounds, though he was using these as a tempting block to try and focus my attention away from his blitz objective which is what happened. 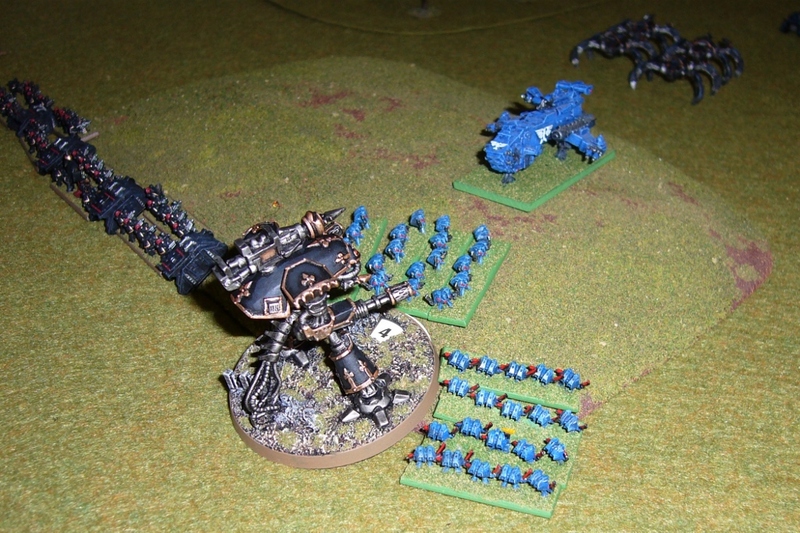 Otherwise a bit of bad luck in not killing the Ravager with Terminators but an interesting game resulted nonetheless! 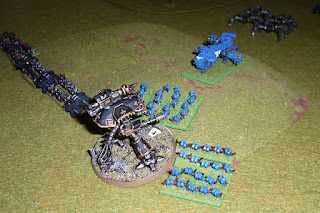 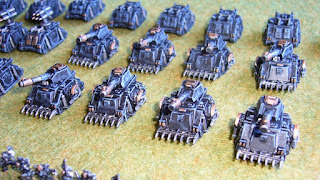 First time for Dave using his newly painted Warhounds and no doubt co-ordinated tactics with them and the air assaults will continue to improve. 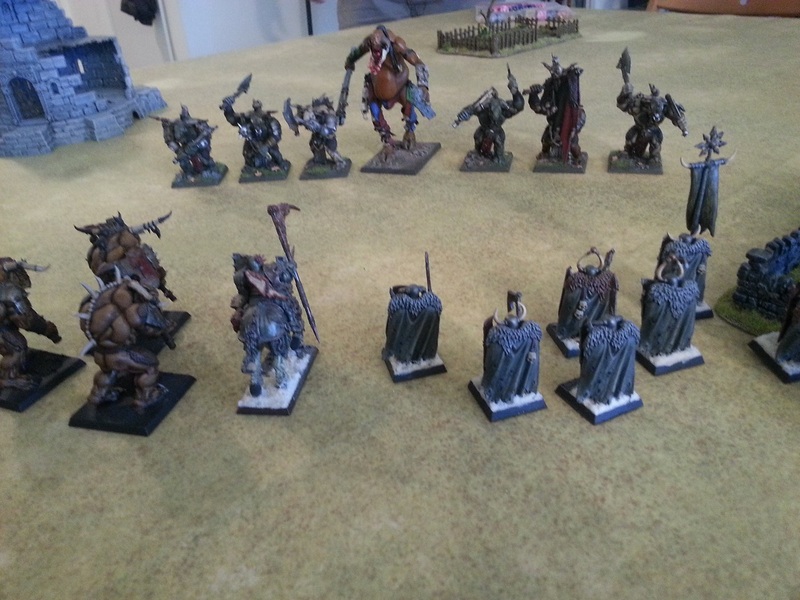 Anyway great to have Dave back in town! 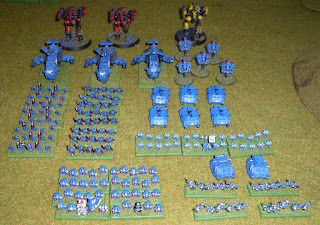 The Thousand Sons return, with some armour formations this time. 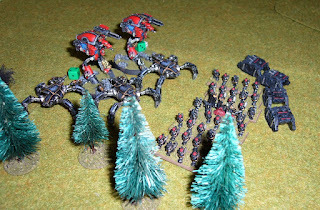 Opposing is a very Kroot heavy Tau list. Both armies left the Supreme Commanders at home. 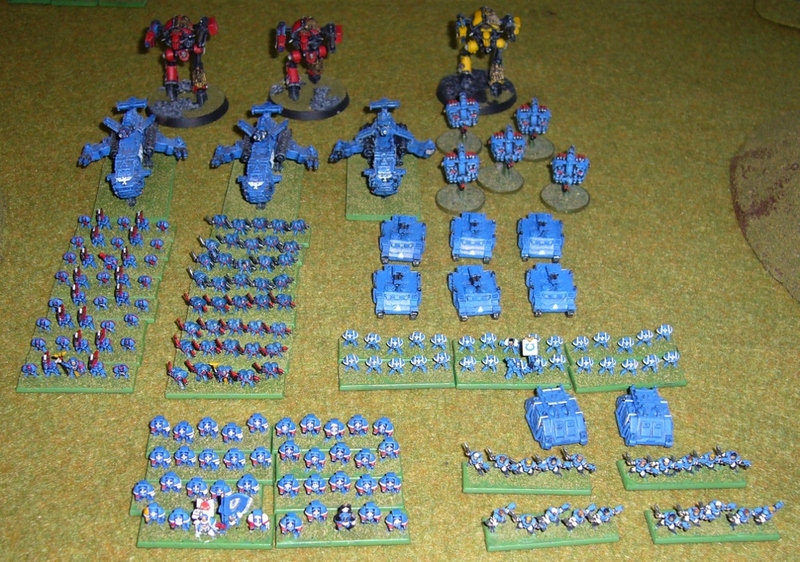 I had 14 activations, the Tau 18. 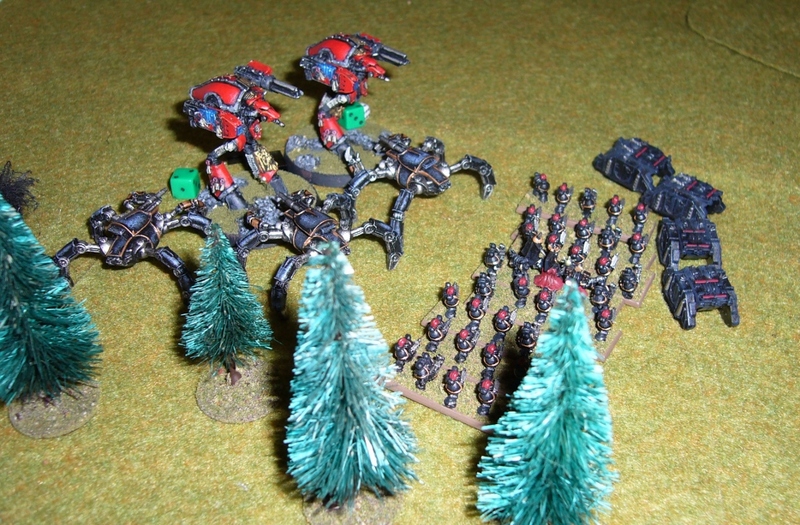 The Tau force included a literal horde of Kroot - 56 of them! 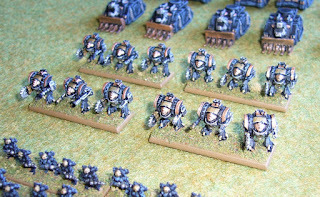 And with the Firewarriors a total of 64 units with Scout ability! 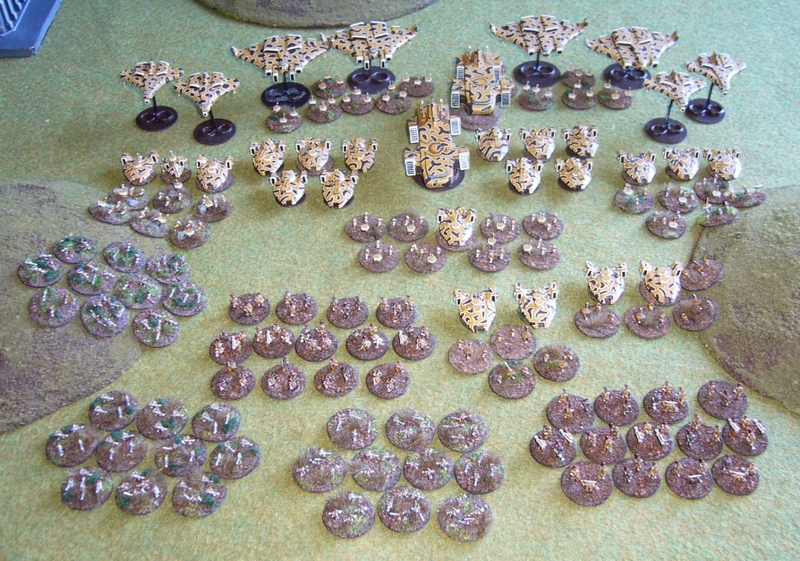 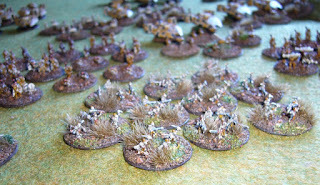 Plus 4 ground assault air formations! 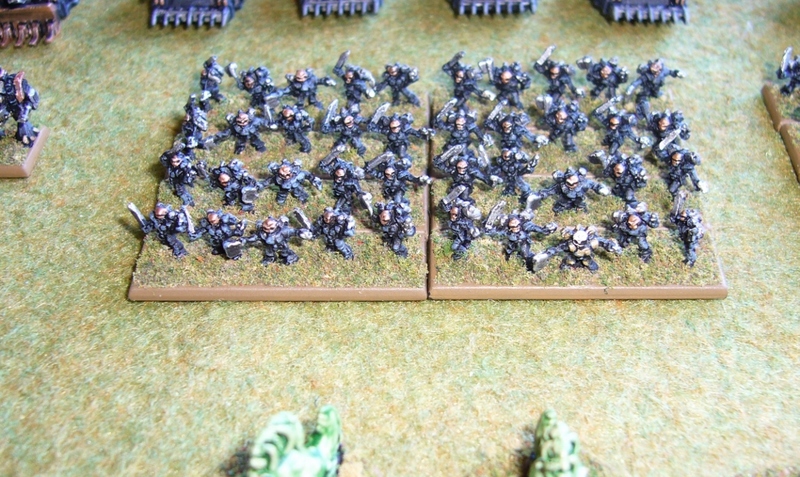 Some photos of the Kroot which didn't turn out very well. 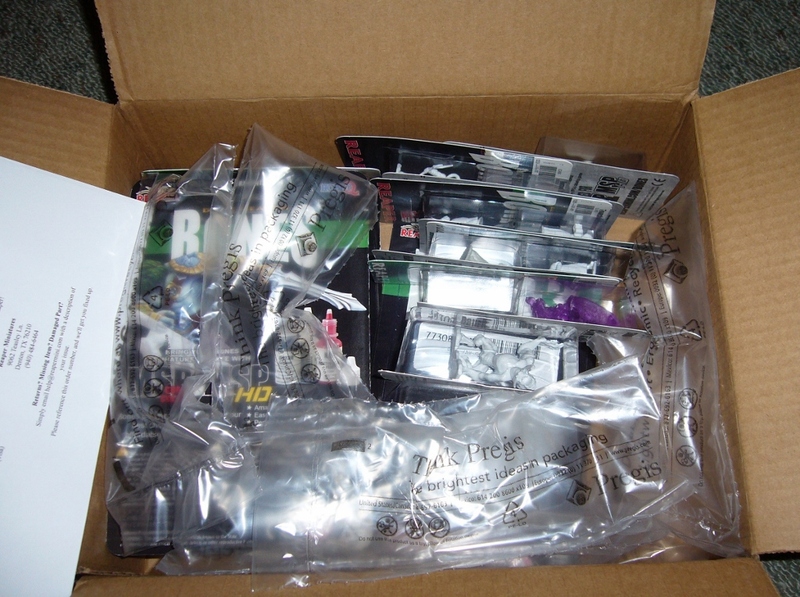 But they are Felines from CinC Miniatures, and Avians from Onslaught. Setup, the Tau have Kroot and Patherfinders garrisoning foward. 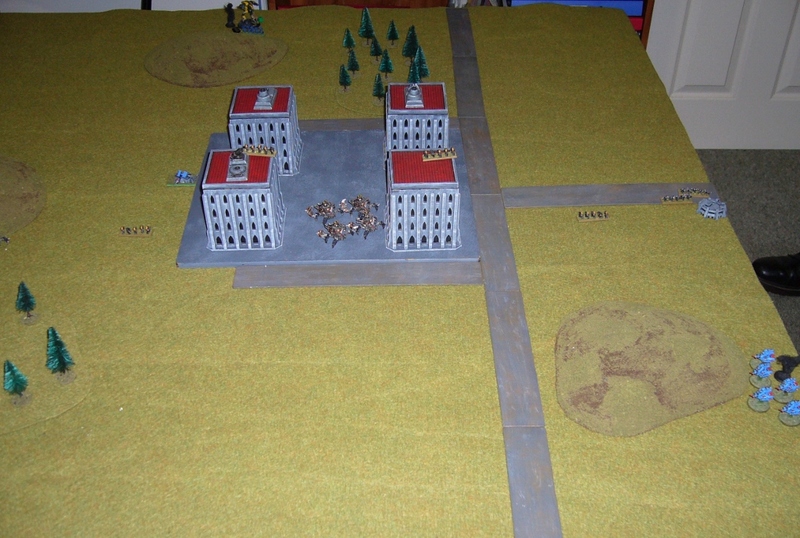 I have two retinues garrisoned, one just ahead of my blitz, another in the town. 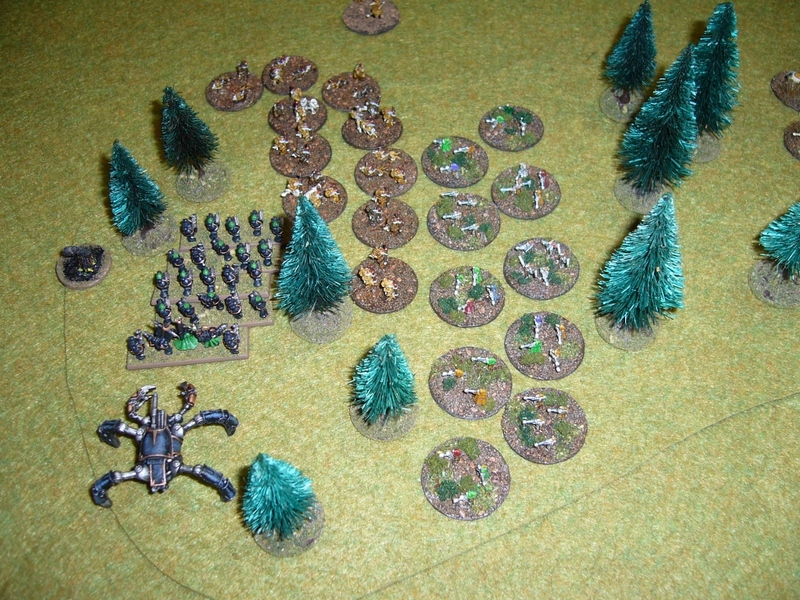 The town situation looks grim, lots of Kroot and pathfinders, and just one small Retinue of mine here. Tau Take and Hold objectives here, mine are near the wood and hill to the left of this. 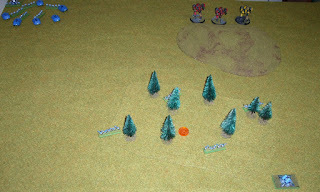 I win Strategy Roll and leave the town for the Kroot. 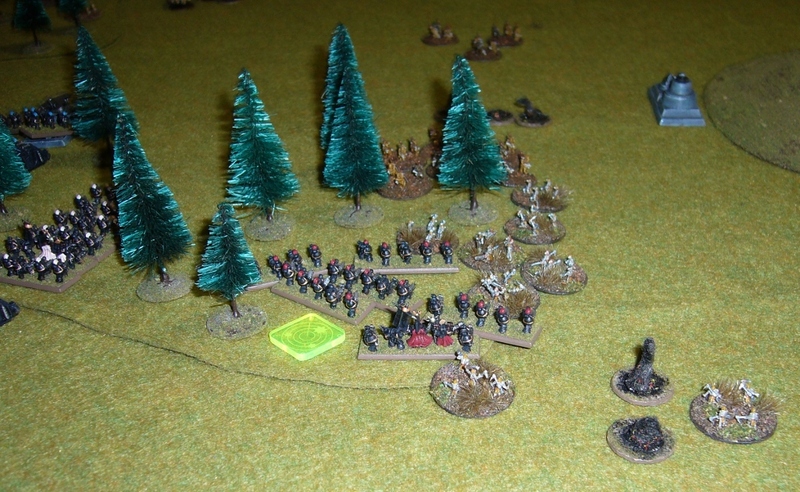 Not fighting these cannibals in there where they will get 4+ armour saves! 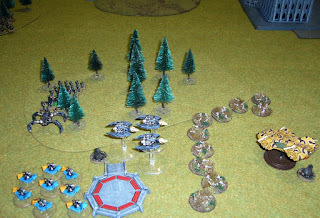 My Orbital Barrage comes down right on top of the Tau "Break Their Spirit" Formation and some Pathfinders, but only kills one unit of each formation, and the pinpoint attack is wasted as there are no targets for that. 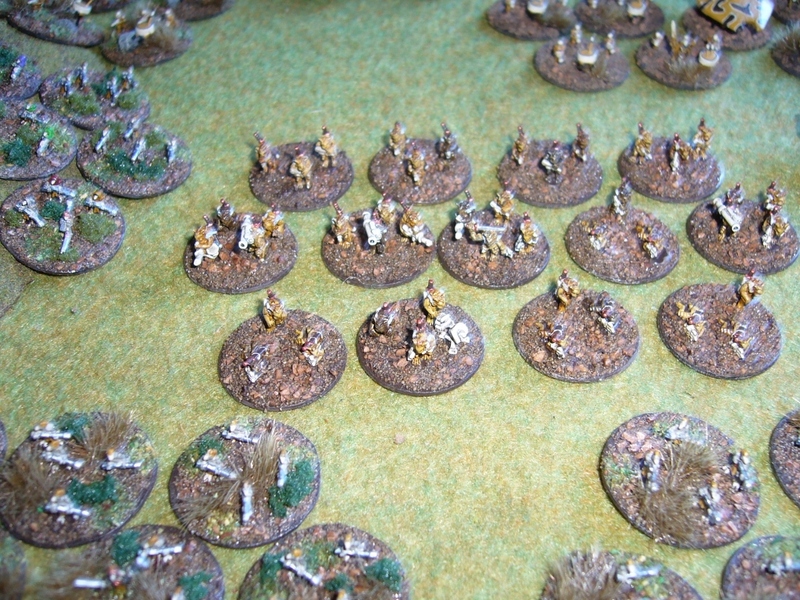 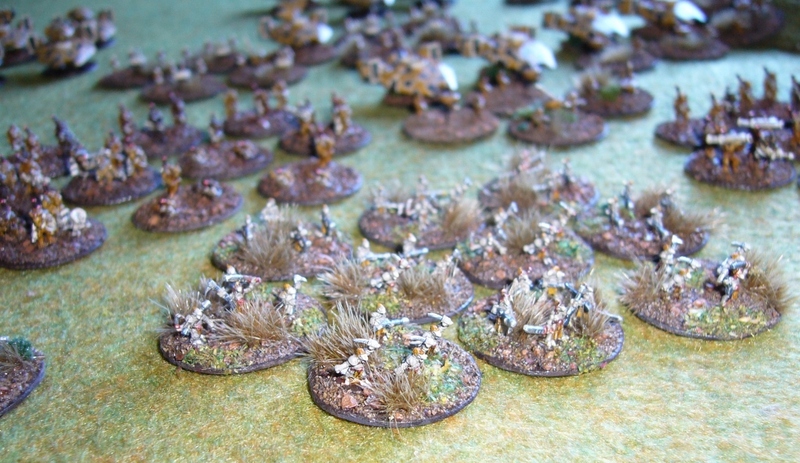 I start pushing up the left flank. 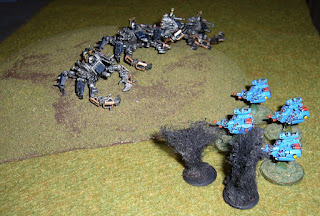 Takes a lot to break the Krootox and Kroot ahead of me... 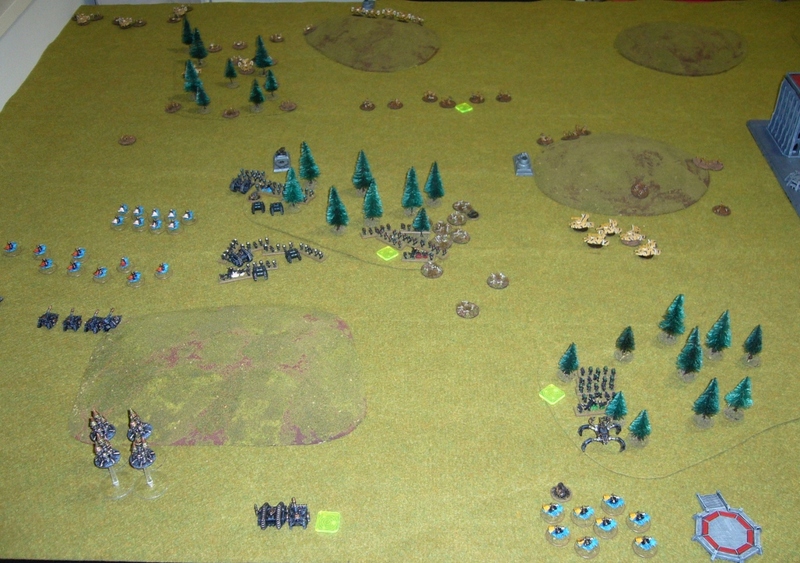 I don't have the speed to engage on the first turn which is sad. 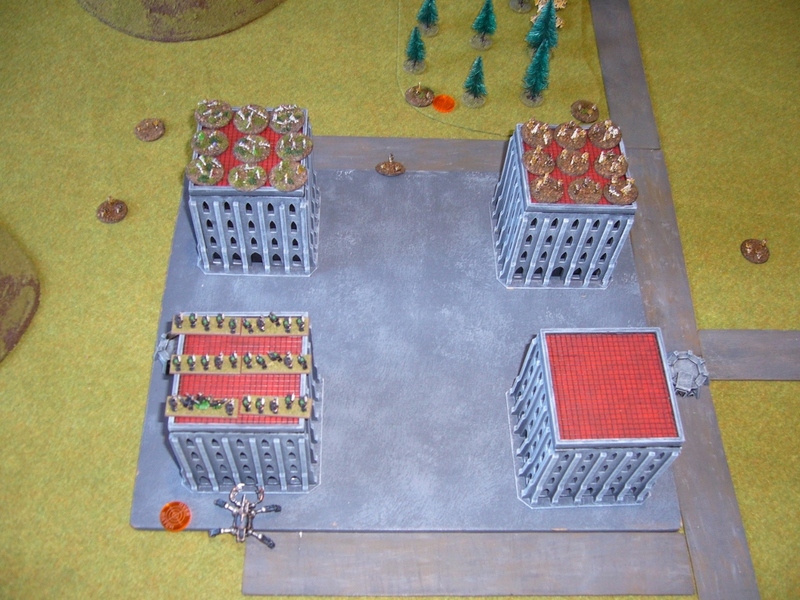 My Silver Towers also fail to activate and regroup. 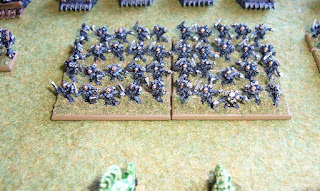 But both Tiger Shark formations also fail to activate so I don't feel too bad about that! A Barracuda flight is intercepted and they abort and jink from hits but one plane shot down. 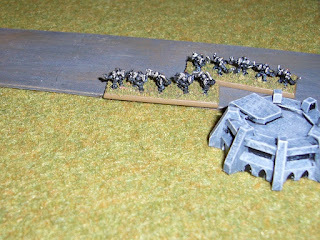 My Retinue with two Defilers doubles forward to press the left flank and add some air cover. 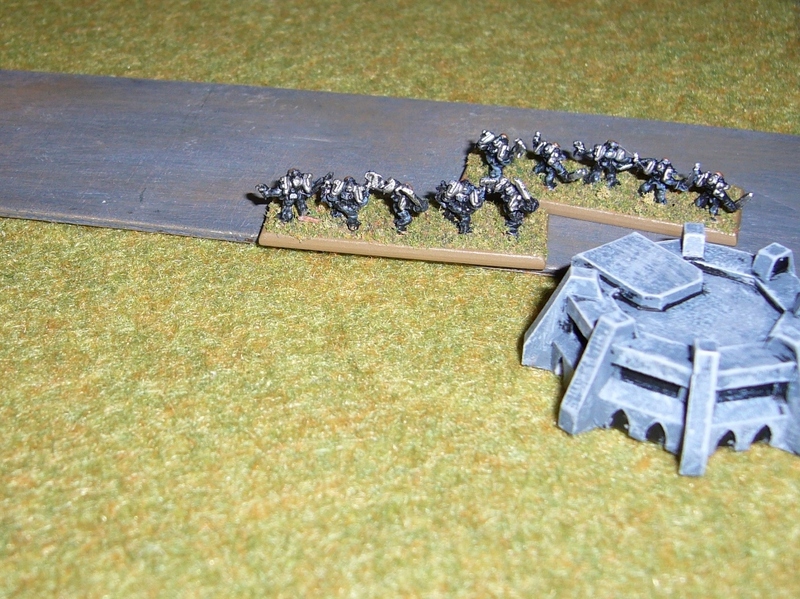 Kroot screen is routed at last. ...and wipe out the Kroot formation for the loss of a single Disc Rider. 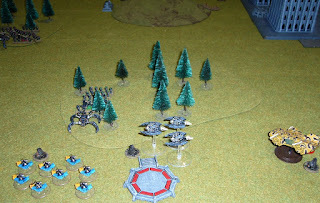 Tau Hammerheads double and kill my two Defilers. And then another air assault. 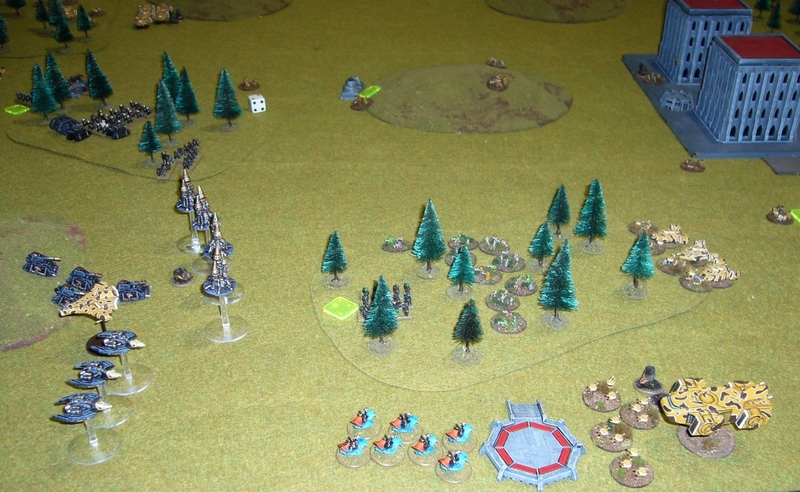 Kroot win this one, but my Fearless Retinue stays where it is. 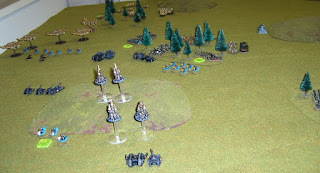 Barracudas intercept my Doomwings but miss. 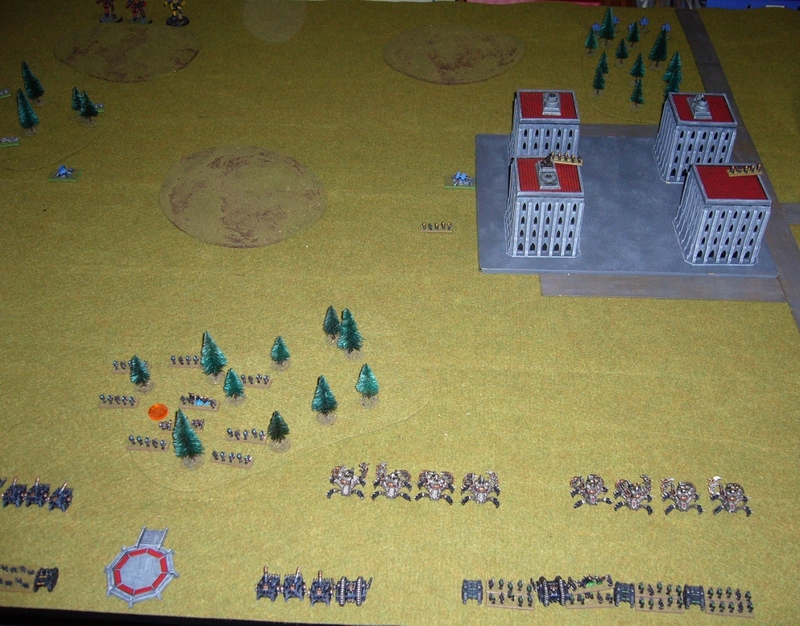 End of turn. 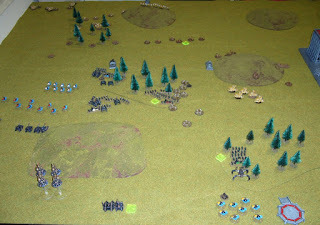 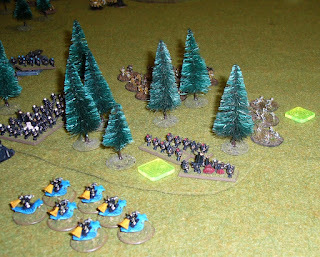 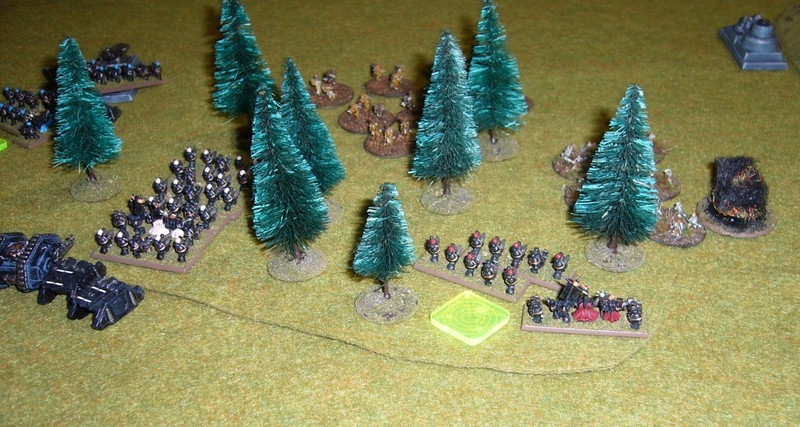 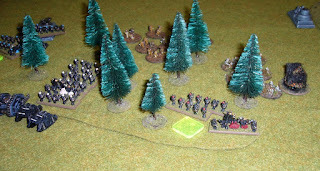 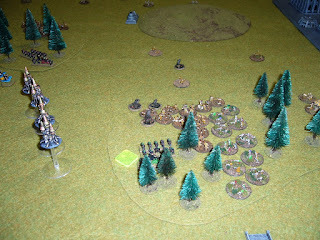 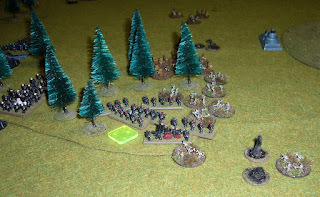 Then most formations rally, except my Break Their Spirit formation in the woods in the centre. 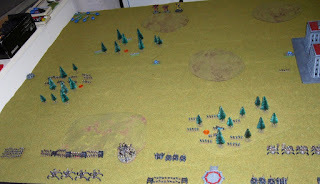 I win Strategy Roll again, my Silver Towers move and destroy the Hammerhead formation. 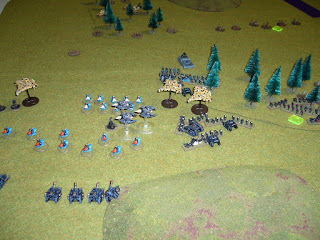 And then I engage and destroy a Pathfinder formation on my left, except for a single unit of it. 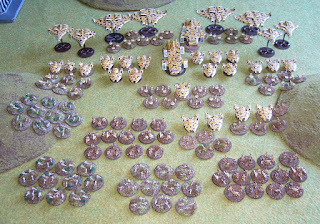 Tiger Sharks drop drones and crossfires a Disc Rider Formation, killing six of them and breaking the formation. 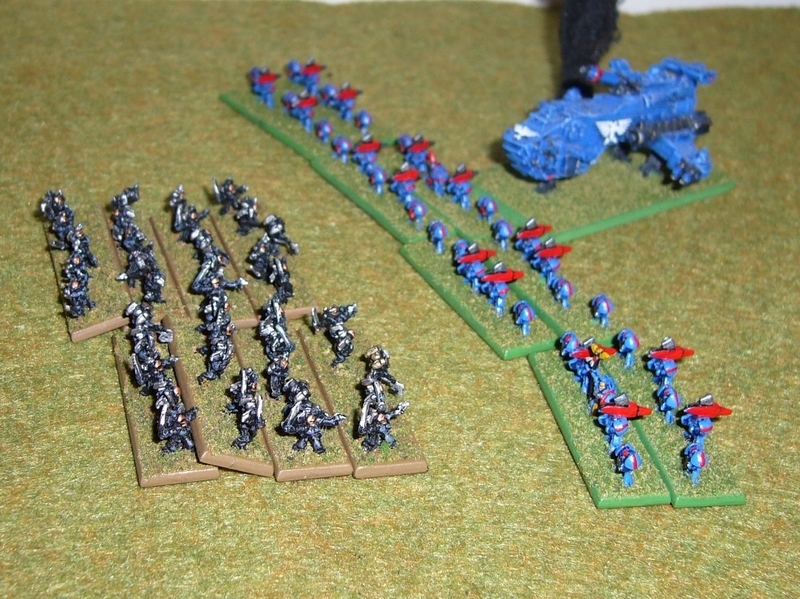 The other Tiger Shark Formation does the same thing, without the crossfire, but only kills a single Disc Rider from the next formation. 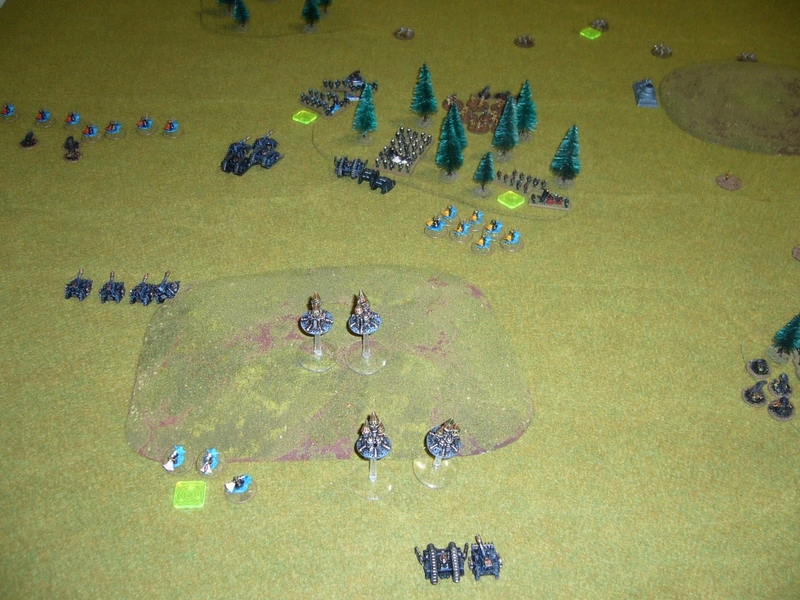 I engage and break another Kroot formation, but the Kroot keep on coming. 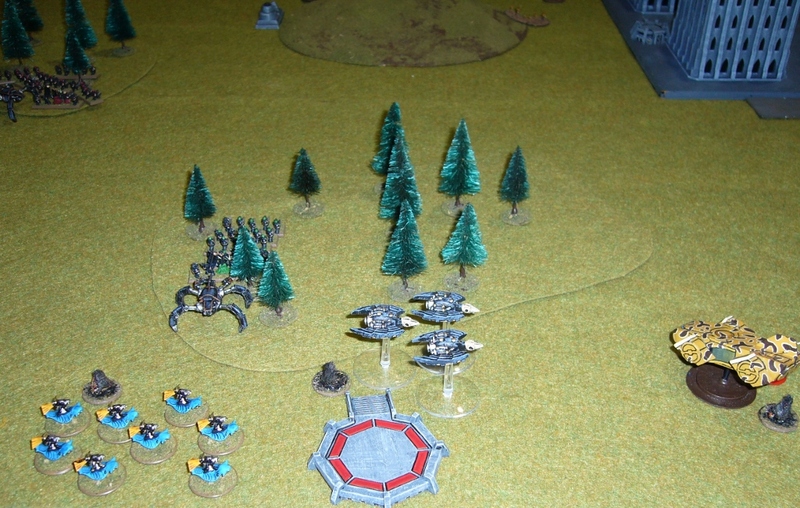 My Predators kill a couple of units from a Drone formation. 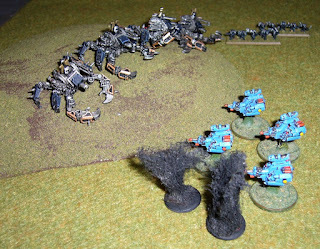 Hammerheads kill some transports. 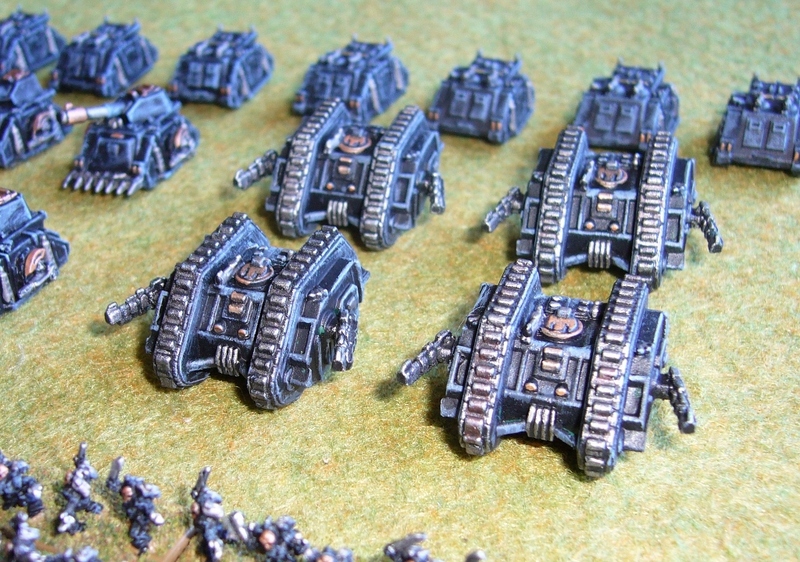 My Tanks miss the Hammerheads. My Disc Riders wipe out a drone formation and break the other one due to it being in support position and one blast marker off breaking. 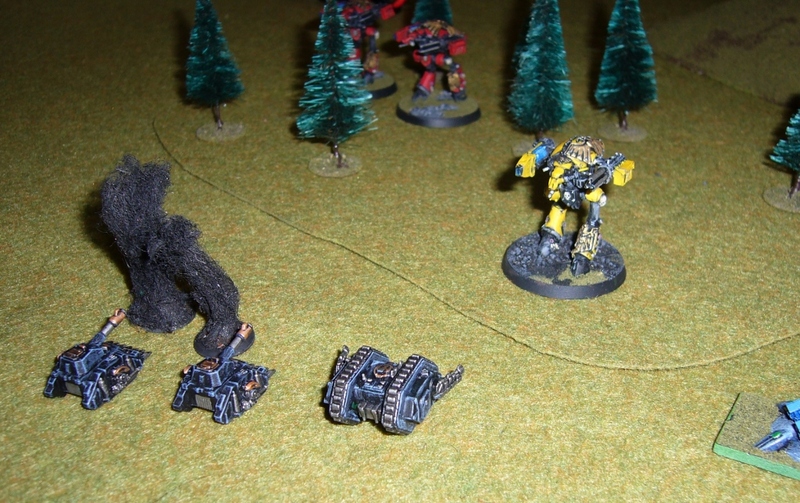 It runs away and is picked up by an Orca. 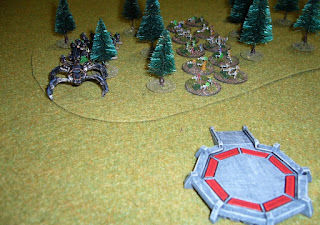 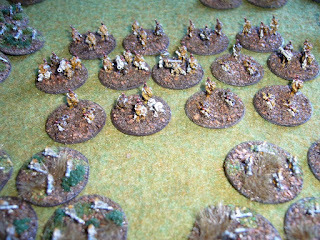 Kroot rush towards my Blitz, taking advantage of the woods for cover. I reinforce my centre with Disc riders to discourage further Kroot assaults on my Retinues here. 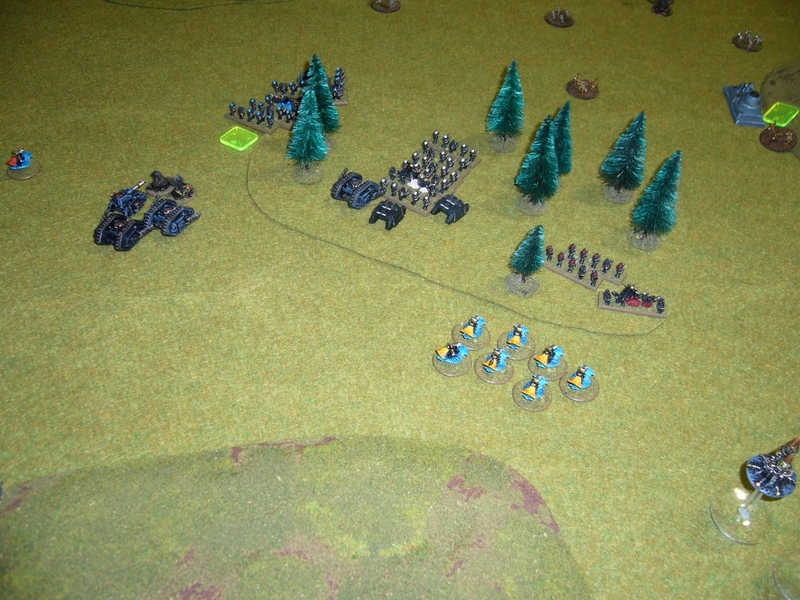 Kroot win Strategy Roll, and engage and break my rallied Retinue near my blitz. 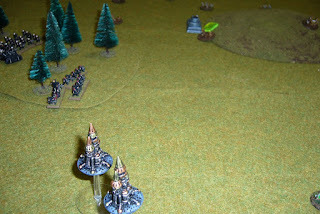 I respond with Silver Towers which single move to firefight support range of the Kroot, and shoot Pathfinders in the open - but kill nothing with their 16 shots!! I engage and break a Kroot formation in the centre. 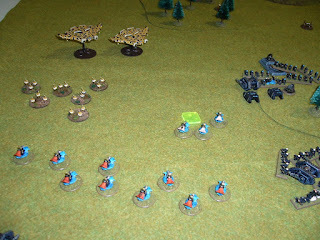 Tau Hammerheads kill one of my tanks. 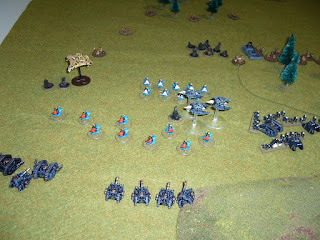 My Disc Riders engage the Tau. Combined assault occurs. I lose the combat, and most of the Disc Riders, but one of the Kroot formations also breaks from casualties. 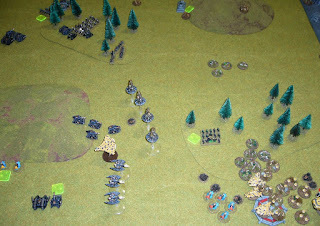 My Break Their Spirit Retinue engages and kills all but one of the Pathfinder formation that the Silver Towers had missed. 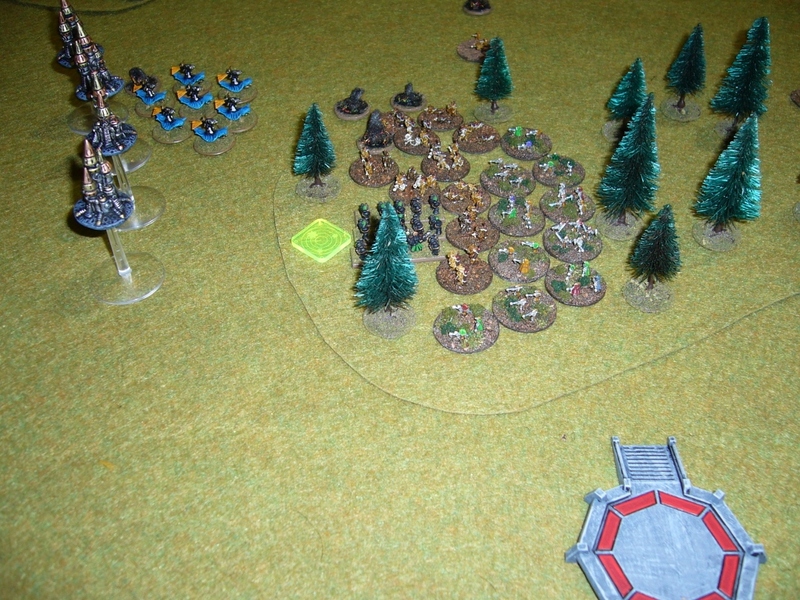 Game over, as the Disc Riders break and I'm out of activations. 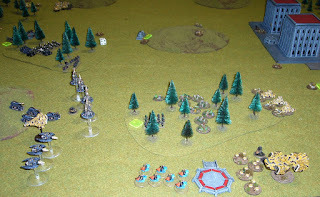 Tau win turn 3 with Take and Hold and Blitz. An interesting game, where I was eventually overwhelmed by the numbers of leaping smashing Kroot. 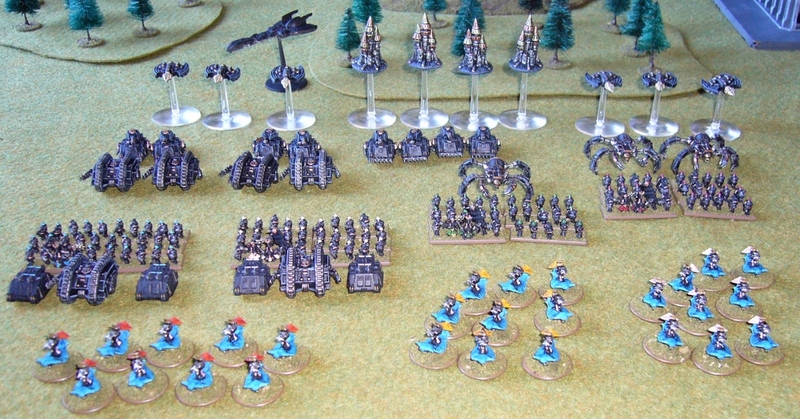 My Thousand Sons Marine Retinues did amazingly in resisting attacks, killing many Kroot for the each loss they suffered. 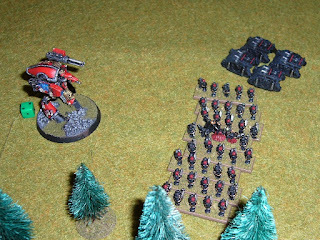 But I couldn't hold my objectives in the end. Two obvious mistakes I made here. 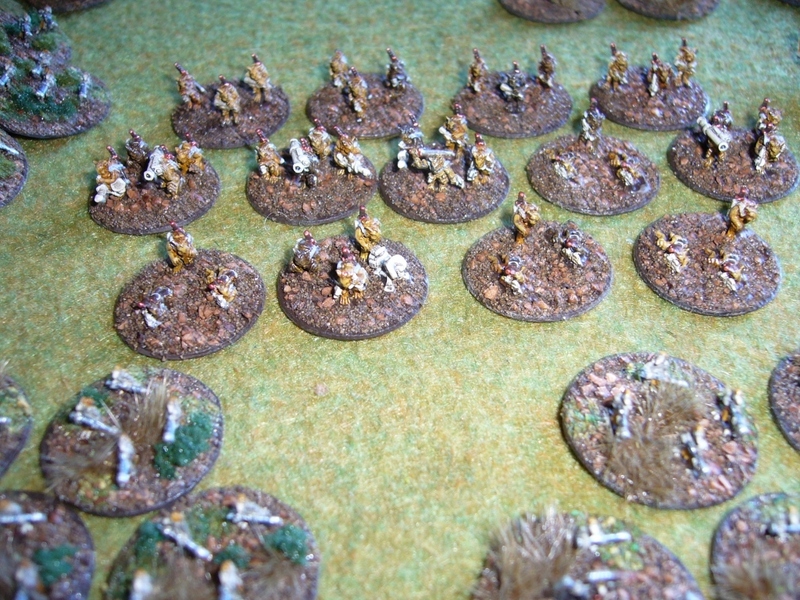 First off army selection, aiming to take some ground AA I included Deceivers in two of the Retinues. However as soon as these formations took Blast Markers they were effectively suppressed and reduced in range to 15cm (the firefight range of the retinue), so that was a stupid idea. 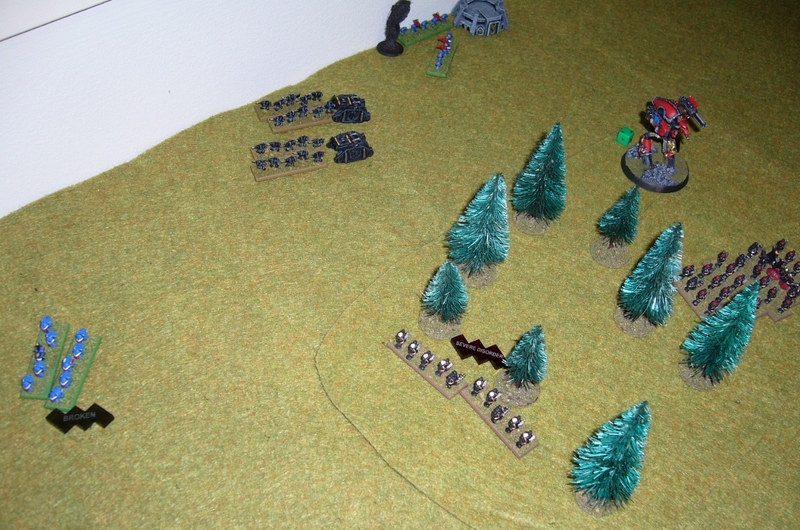 Secondly, I put my Blitz objective near a wood, which meant the Kroot had cover as they advanced on it. 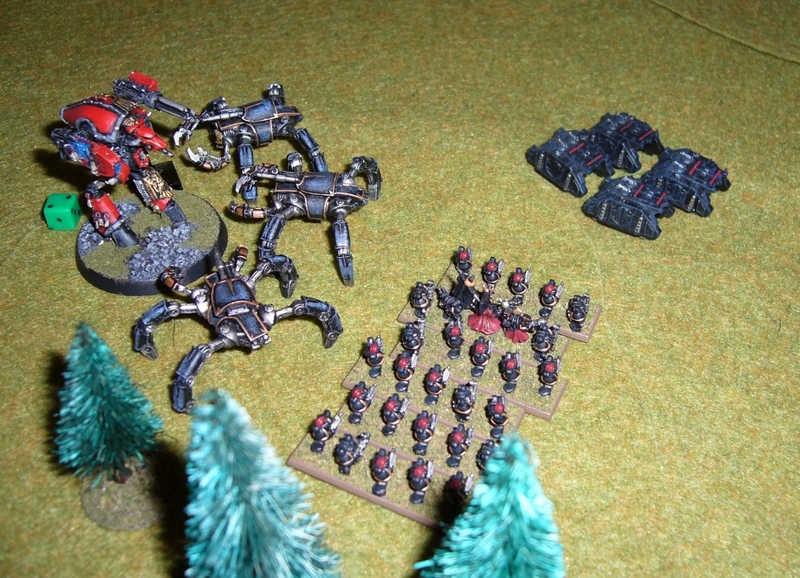 Would have been a much better idea to have it in the open, where the Kroots lack of armour and my superb Reinforced Armour would have been more telling. 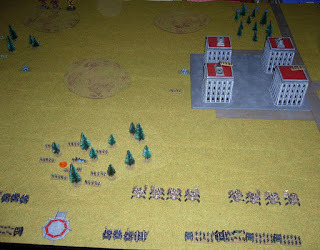 The difficulty in removing the scout screens also really caused problems. 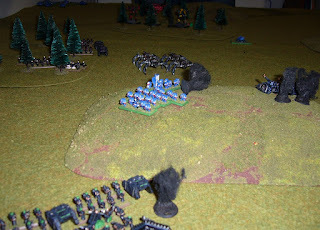 A game where having Thousand Sons teleporting units would have been more useful! Anyway cheers for looking.